Get your personal assistant in your pocket that will make all your work done instantly. Yes, with Helpchat you can easily get all your tasks accomplished like recharge, buying groceries, receiving updates on latest deals around and lot more. 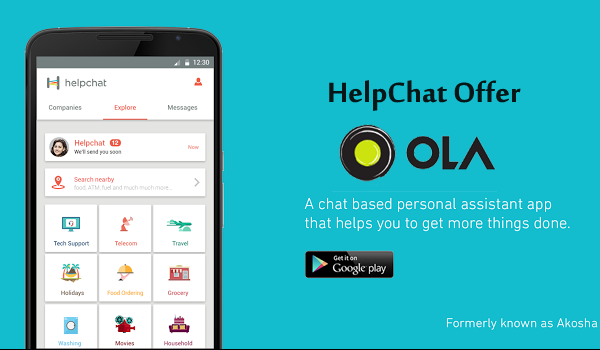 Helpchat is currently offering a super saving deal where you can ride with Ola and get upto 50% cashback. This offer is for all the Helpchat users. Book your Ola ride with Helpchat. First time Helpchat users will get a 50% cashback and for old users Rs.50 cashback on rides above Rs.100. Offer is valid from 16th Feb-19th Feb.
No promo code is applicable. Booking should be made using the connected Ola account only. Cahback will be credited to your Helpchat account in next 48 hrs.